In the previous story course article, I talked about the Storywheel, which brings all of the great stories together into one grand design that reveals the evolutionary passages that once took us to a very high state of consciousness, and can now help guide us back to that extraordinary lost psychological Camelot. In this article, I will introduce you to our story model, The Golden Paradigm, and the powerful hidden structures that created it – which in turn are the same hidden story structures that all the great stories have in common. After that, in future articles, we will begin our step by step journey from the inspiration to the final draft and explore in depth each of the Golden Paradigm’s hidden structures and how to use them to create a great story with a truly unique metaphor. Be that as it may, The Golden Paradigm is also our model of the Creative Unconscious Self, the engine that drives our evolutionary path, and, as such, it holds the keys not only to creating a great story but to the recovery of our lost and forgotten inner selves. So what are the remarkable hidden structures all of these great stories have in common? If you’re familiar with Aristotle’s Classical Story Structure, you will find it in the Golden Paradigm in the structures of the inciting and principal actions, when those actions encounter resistance. If you’re familiar with Joseph Campbell’s The Hero’s Journey, you will find that on the upside of the passage. But keep in mind that the Classical Story Structure and The Hero’s Journey are only a small part of what you will need to know to master the craft and create a great story every time. The larger entity being transformed is the larger context which surrounds and supports the stories being told. It can be a family, an institution, a town, a corporation, a country, a government, the world. It can, in fact, be any human group we form that is organized around a leadership. The story focus is the part of the larger whole story that we actually see. The subject of the story is, of course, what the story is about. As stated in an earlier article, the interplay of these three structures, the larger whole story, the story focus and their subjects, makes a psychological connection that is so powerful that it rivals the hero, the central action, and the classical story structure in importance. The problem, the threat, the change of fortune, and thecomplications, crisis, climax and resolution of the classical story structure constitute the very essence of story – that without which there would be no story. Which is to say, if you eliminate any of these essential elements from your story, it won’t feel like a story. Some of the other important structures are: the value being pursued the scourge being avoided, the central action, which contains the plots and subplots, and the higher self and the lower self. In a great story, the metaphors (characters) which represent the higher and lower self (the dual sides of our nature) are both trying to influence the central characters, and the rivalry between these two powerful forces makes the passages and the story happen. Then there is the terrible element(s) – the thing without which the problem could not have been created and the marvelous element(s) – the thing without which the problem cannot be solved. The circles inside the Golden Paradigm, and at the four cardinal points, represent the archetypes, the major players and characters of the story. And it is worth noting that we also encounter these same archetypes and characters in our own psychology and in the different roles we are called upon to play in the real world. 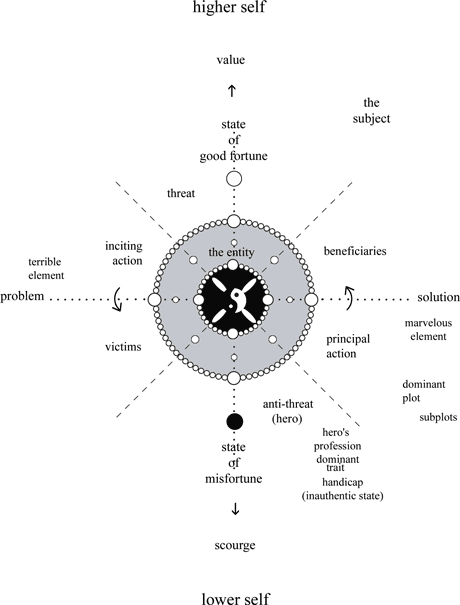 The small circles around the circumference of the Golden Paradigm represent the actions and plots of the story which in turn reveal the passages that can lead the antihero to his or her goal, the hero to his or her solution to the problem created by the antihero, and us to higher or lower states of being. As I’ve said before, while I was discovering these patterns, and I’m talking about a time period of about 30 years, I remembered something that Aristotle had said: that genius was seeing the connection between things. That inspired me to look for these structures and patterns in other things – and I discovered these same patterns in our own psychology and also in the real world, in the psychology that underlies the groups that we form – which is to say that our psyches (the creative unconscious self) and the groups that we form have the same underlying structures as the structures found in a great stories. Then, once I understood how, with our unwitting help, the creative unconscious was cleverly programming this information into great stories, I realized that the truth about these two realms, our psychology and the psychology underlying the groups that we form, is what great stories are designed to reveal. And finally, I realized the patterns in great stories were road maps to these evolutionary stages and the great stories (and the creative unconscious self) were there to help guide us through these passages. And now, twenty three years later, I am still celebrating that event. Needless to say, these hidden structures are intimately linked to our creative unconscious selves. They are, in fact, the content of that remarkable resource. And because of their extraordinary psychological connections, these hidden structures, as I’ve said, are extremely powerful and the reason why some great stories defy time and remain relevant for thousands of years and why others become so charismatic religions, that unify the beliefs of millions of followers, are formed around them. But, if the great stories all have these same structures, why do they seem so different from each other? Can stories as diverse as The Godfather, Superman, Cinderella, Hamlet, Groundhog Day, Harry Potter, The Lord of the Rings, and A Christmas Carol really all have the same underlying structure? Yes. They can and they do. What appear to be differences between them turn out to be variations in the metaphor, the genre and the narrative structure. Variations in the metaphor are differences of time and place – differences of who, what, when, where and why, which give each great story the appearance of having its own unique world. The Lord of the Rings and Harry Potter, for instance, have the same underlying structure, they are, in fact, almost identical stories, but because of the uniqueness of their metaphors – the differences of who, what, when, where, and why – they appear to be truly unique. Variations in the genre are created by the dominance of one story dimension over another. When the mental plot becomes dominant, you create a mystery. When the emotional plot becomes dominant, you create a love story, and so on. The dominant plot gives the story its genre, and this creates another whole set of apparent differences. And the same is true of the narrative structure. Once you’ve worked out the story and supported it with these hidden structures, there are an infinite number of ways to tell that story. Not only can you focus the story anywhere within the larger whole story that you like, you can tell the story in almost any sequence, and from the POV of any character. All of which help to make each great story appear to be different, when, in fact, they’re not. In summary, the secrets being revealed by the Golden Paradigm and the Storywheel include all of the archetypes and passages that can lead us to the higher states of being and awareness, and all of the life cycles we experience from birth to full maturity that were achieved by our distant evolutionary ancestors and have been preserved, like ancient artifacts, in story for tens of thousands of years. And you can use these models not only to analyze and create great stories, you can use them in every aspect of your life. You can use them to fathom your own psychology, analyze important events in the real world, and, as these evolutionary cycles inevitably repeat themselves, get vital glimpses into the future. The good news in that respect is: if we work with these great stories and unravel their secrets, we can soon rid ourselves of the Promethean eagle that is currently making a daily meal of our livers. In the next story course article, I will talk about The Creative Storymaking Process, that will be followed by The Six Creative Techniques that can help you better communicate with your ideal creative partner – the creative unconscious self, the source of your creativity. After that, each of the story structures and dimensions of story mentioned in the above article will appear in their own in depth articles.